The Interconnection refers to scenarios where traffic crosses different networks. When the call enters the home network the operator charges the Interconnect partner for using his network. When the call leaves the home network the operator has to pay the Interconnect Partner for using his network. If any operator is sending/receiving of calls to/from other operators (outside the network) then both the operators needs to be interconnected i.e. both operators should have a network based interconnect to send/receive calls to/from the network. The routing of call based on trunks (a physical wire connected at switch level). When the call comes from other network to home network this call treated under inbound and the operator charges the Interconnect partner for using his network. When the call goes to home network to the other operator network is termed at outbound and the operator has to pay the Interconnect Partner for using his network.. This setup requires some kind of billing mechanism to monitor the actual amount of data (send/received). 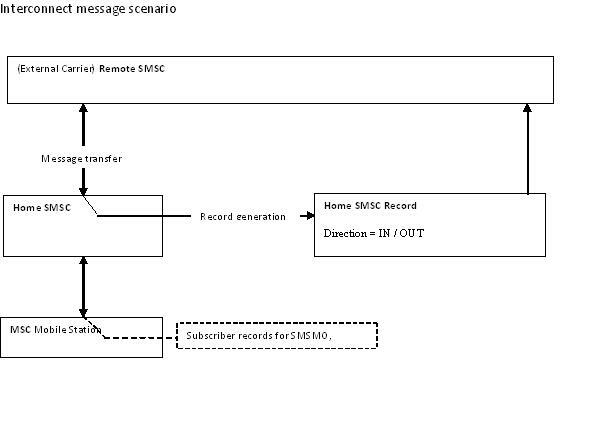 The operator who finally receives data (Voice or SMS) from other B Party operator is know as Terminating partner and call detail of A Party is treated as Mobile terminating call (MTC) while Bparty operator is known as Originating Partner and call details (call type) of Bparty is treated as Mobile originating calls (MOC). Beside this operator can works as Transit Network i.e. it receives data (voice or SMS) from one operator and delivers it (as it is) to any other operator. To transfer data (voice or SMS) to various destinations, general purpose carriers are used that sends data according to the country code. In Interconnect scenario. Mobile operator has agreement with various business partners for routing the calls. When a home subscriber receives a call from external network the external network pays the invoices in terms of volume usage of home network .This is called interconnect inbound. Interconnect outbound:In this case A party of home network calling to B party of external network. MOC CDR generated which contains Information of A party IMSI, ICCID, Mobile number,Calling party number,Cell ID, Timestamps, duration of calls, Trunks groups information. An Transit CDR is generated for calling party at each additional MSC. This contains information about routing trunk group. Interconnect Inbound: In this scenario B party from external network call to A party at home network and thus home network trunks is needed to terminate this call. Mobile terminating call record generated. Roaming call forwarding (RCF) generated at very first MSC. Consider a call originating in the home network of the subscriber, and terminating at a destination in a different network. Several transit networks can be involved. Each network collects CDR‘s at its own switches for billing and reconciliation. Basically, incoming traffic will be billed for, and outgoing traffic relates to reconciliation. Rates depend on the charging policy, if it is destination based billing then rates is specified according to the area code of terminating destination. While In distance based billing, rates are specified according to different zones. In general billing (Inbound/outbound) is done using total answer minutes routed through trunks. The incoming trunk and out trunk information is taken from call details (CDR’s). We also analyze traffic and monitor utilization trunks over switch. This entry was posted in Interconnect Billing and tagged Interconnect. Bookmark the permalink. Nice beginning! Buddy keep on pouring more information…. Could you please explian how we detect fraud over international carrier by the way this is informative. SIMBOX is major source of fraud that bypass interconnect carriers. I will keep update on the same on next post. nice article ,i enjoyed reading this,well written. keep it up man. hello Prasanna, Indeed great post about ICT billing over net.The way you brief the topic is really appreciable. thank you for the great tutorials, we truly appreciate your contribution. Great initiative dude , really appreciate for your great work.